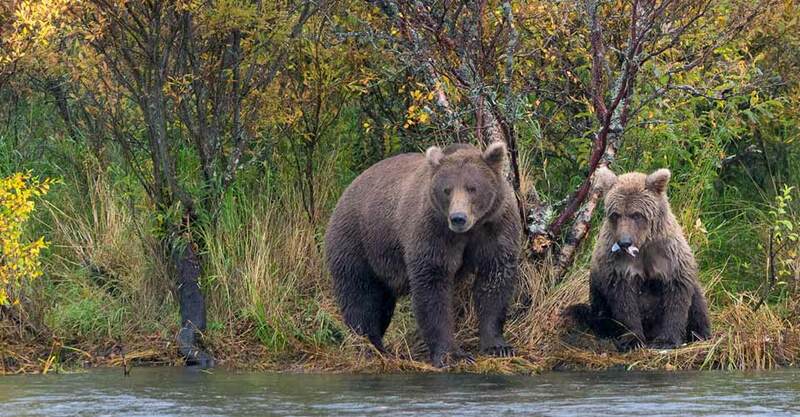 Photograph Alaska's Biggest Bears During Their Fall Feast—with No Crowds! 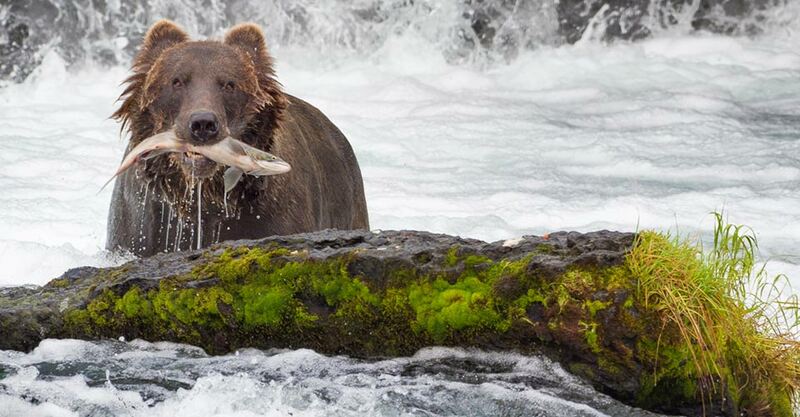 Follow the whims of the world’s largest coastal grizzlies in Alaska’s Katmai National Park during a scenic and uncrowded time of year—after the lodge at Brooks Falls closes for the season and most visitors disappear. But numerous bears still congregate here in the fall, indulging in a final round of gluttony before settling in for a long winter’s sleep, and we come to watch them feast. Each day, travel by private floatplane from our luxury fly-in wilderness lodge to the Brooks Falls area, touching down in the bears’ domain. Along the Naknek and Brooks rivers, capture exhilarating images as bears devour the remaining bounty from summer salmon runs. Autumn’s earthy tones and a low-slung sun cast a golden light upon the scene—a late-season mingling of cubs, healthy females, giant males and subadults. The bears are sated and relaxed, creating thrilling subjects for a rare fall photo expedition you won’t find anywhere else. A Different View on the Bears of Brooks Falls...Only with Nat Hab! Nothing evokes Alaska like grizzlies and salmon. And the majestic Brooks Falls bears, taking advantage of the last salmon before winter sets in, are among the planet’s most iconic wildlife images. While you won't see them fishing in the falls this time of year, they're still all over the area fattening up for winter on the salmon that remain—and this special bear-focused photography expedition puts you right in the midst of them, after standard tourist facilities are closed for the season. We take you to the heart of the action near Brooks Lodge, but we arrive after public facilities have closed. We're likely to encounter few other visitors, even though the bear population is often significant this time of year, as they continue to lounge along the river and feast on abundant salmon long after a change in the weather drives most humans away. Though it could be cold and rainy, we might also get low-angle autumn sunlight, lingering fall colors and potential snow dustings—with the bears at their heaviest weight, it's a photographer's dream. 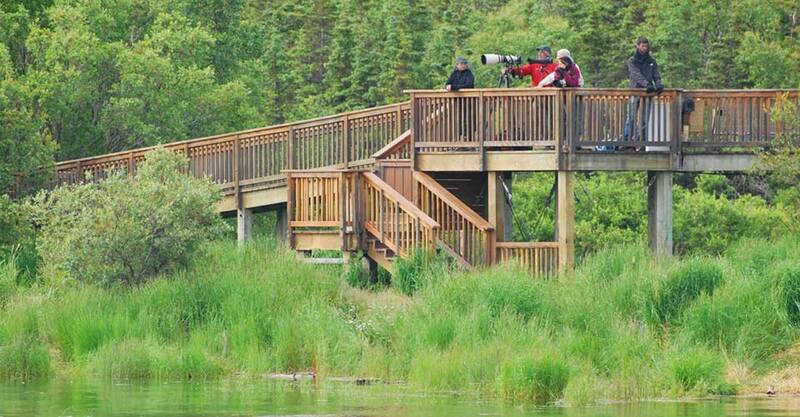 Our itinerary is focused on bear photography from start to finish. 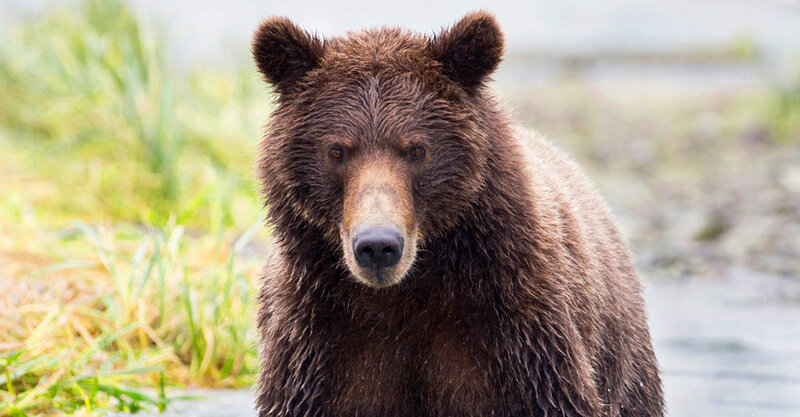 On this six-day trip, we spend four days in the field observing Alaskan brown bears (the world's largest coastal grizzlies), with a private chartered floatplane on call to make sure we get close-up views of bears daily, wherever they may be. Even unpredictable late-season weather makes this a coveted adventure, since the prospect of frost or snow can provide exceptional photo opportunities. The beauty of this trip is that if the bears are not hanging out directly around Brooks Falls on any given day, our private chartered floatplane will deliver us to exactly where they are. 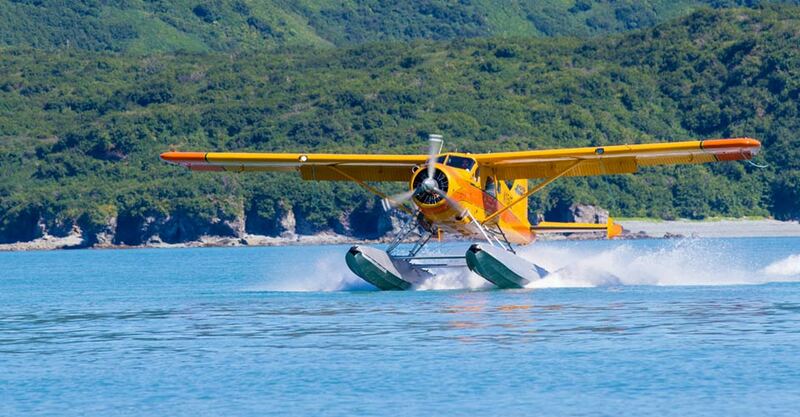 It's like a private "air taxi" that gets us wherever we want to go, with the flexibility to maximize time with the bears and bonus opportunities for flightseeing on our daily trips in and out of Katmai National Park. While conditions in the field are rugged, bush-style luxury awaits as we return to Alaska's Gold Creek Lodge each night. On the edge of Katmai National Park, this cozy, well-appointed, family-run lodge provides gourmet meals, a fire roaring in the hearth, and deluxe private cabins and yurts that restore you for another day in the backcountry. This remote retreat is the perfect respite after a day of hardy bushwhacking in the elements as we search for bears. Our Expedition Leaders are among Alaska's premier naturalist guides, as well as superlative wildlife photographers who are gifted at sharing photography tips and guidance with guests. We take pride in employing the most qualified, dedicated and passionate natural history guides, who also receive additional training from leading WWF scientists. Our Expedition Leaders regale guests with their in-depth knowledge while remaining close at hand to ensure safety and comfort in every respect. See Expedition Leader bios and traveler comments regarding the quality of our leaders. Natural Habitat Adventures offers an exclusive guarantee, which clearly states that we will meet the lofty expectations established in our promotional materials. To our knowledge, this is the most ambitious guarantee made by any adventure travel company. Read our important promise. We care deeply about our planet, as we know you do. When you travel with us, the carbon emissions from your trip are 100-percent offset—Natural Habitat Adventures is the world’s first carbon-neutral travel company. Because of our commitment to environmentally friendly travel, as well as the exceptional quality of our adventures. World Wildlife Fund— the planet's leading environmental conservation organization—has named Natural Habitat as its worldwide travel partner, a designation that makes us exceedingly proud! Fill out the form below to receive additional information about our Bears of Brooks Falls: Solitude Season. Hi Nat Hab, I’m interested in your Bears of Brooks Falls: Solitude Season. Can you please contact me with more information?